The Fine Gael deputy’s presence at the event has drawn praise from many quarters, and Deputy Mathews prefaced his comments with a statement that “I want to give 400% to the efforts of the Taoiseach and Minister for Finance” in getting a debt deal, but that Peter would be more forceful. It is always fascinating to see a politician that is at heart a conservative, advocating, what is dismissed as a radical solution to our debts. You can listen to Deputy Mathews’s speech here from 8 minutes in for about 17 minutes. No-one will be surprised to hear the Deputy for Dublin South (a) supporting his colleagues in their efforts and (b) demanding more attention-grabbing efforts to secure a debt write-down. His attendance has been deeply praised by the organizers and attendees on Saturday. 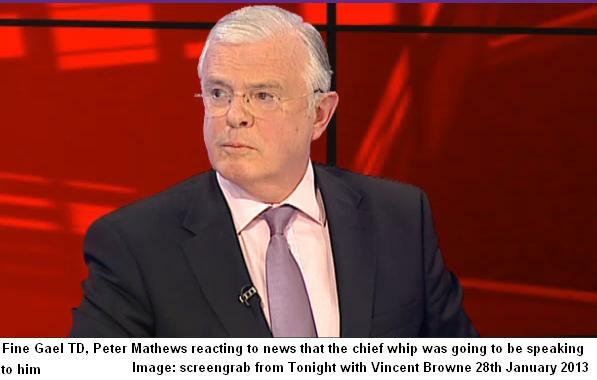 Last night on Vincent Browne, the Fianna Fail senator gave his support which could be a bit of a poison chalice but the support from Mick Clifford of the Sunday Times would be more neutrally intentioned. Deputy Mathews’s attendance might have garnered national headlines, but the other speakers delivered worthwhile speeches, Declan Ganley donned an unashamedly capitalist approach in stating the simple fact that investors in failed enterprises make losses, Luke “Ming” Flanagan the Independent TD from Roscommon roused the room in a language that deeply resonated with people, Michael Taft the union economist talked about his recent research based on figures supplied by Eurostat, which show that Irish people are shouldering a bank debt which is many magnitudes greater than our partners in Europe, the pressure groups had two minutes apiece and the commonsense spoken was astounding with calls to organize and Awake Ireland referred to their case to have the debt declared odious and non-payable under international law, and Independent senator Sean Barrett advocated learning from a history of Irish bailouts and provided an overview of the cost and effects of the banking collapse. Worth a listen. So maybe Paul Kehoe will “give a talking” to Deputy Mathews but the talking might be along the lines of thanking the Deputy. The speakers weren’t insulting the Government, they were shoulder to shoulder with the Government in supporting efforts to deal with the bank debt, but want a more forceful approach that delivers results from negotiations that have been ongoing for at least 18 months. And all Deputy Mathews did, was to bring to a local community, the admirable message that the Government isn’t aloof and that the Government is engaged in dealing with the problem, just it could do with a bit more steel in its rod. Deputy Mathews took some flak from the people present during the Q&A, for sticking by the Government, and in response why he didn’t cross the floor, he responded that he crossed Europe to bring the message to the Bundestag. Iceland president: Let banks go bankrupt. Fighting back the tears listening to that ballad. My head is crushed thinking of the unfairness of it all. The dark shadow of bank bonuses hangs over this beautiful video. Please send a copy to our former Bank Regulator. I hope it keeps him awake at night. Far from losing sleep on the matter, the former Bank Regulator is now enjoying a cushy life AT YOURS AND MY EXPENSE. The current Taoiseach and Finance Minister obviously believe he has earned this reward. Con Horan was head of banking supervision at the Financial Regulator’s office until 2007 when Patrick Neary became Regulator and Horan was promoted to prudential director. He interacted directly with senior bankers in Ireland during the final years of the crisis. He is now set to stay on in Europe for an indefinite further period of time. Horan originally was appointed to the European Banking Authority (EBA) on a two-year secondment funded by the Central Bank, which was due to end in April. I just can’t figure out what the FGers are up to really. They’re not fiscal conservatives, that much is clear. They don’t appear to be social conservatives with the way various reforms are going. They’re not big on law and order given the Gardai cuts and the toleration of recent matters with the judges. I don’t see any plan from the party, either for the country or for itself. The only thing they seem eager to accomplish is to cement themselves as the permanent replacement for FF. I feel sorry for Peter Mathews. He’s a socialist with a truly caring heart inside conservative clothing. It’s not his fault – I blame the Jesuit education. The conflict comes out every time he tries to argue the FG case. He finds it difficult to defend the indefensible. He admires the SF TDs and feels more comfortable with their social policies than those of Fine Gael. It’s the “Rolls Royce”. It covers the world and nothing else compares.